Making a Radio-Controlled Model "Saratoga"
People old and young enjoy waxing nostalgic about and learning some of the history of early electronics. 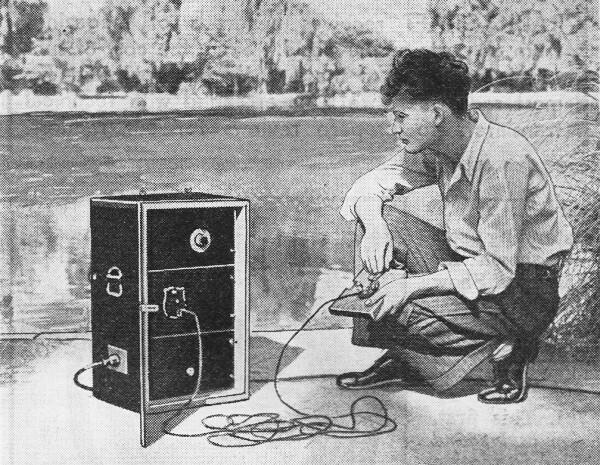 Radio-Craft was published from 1929 through 1953. All copyrights are hereby acknowledged. 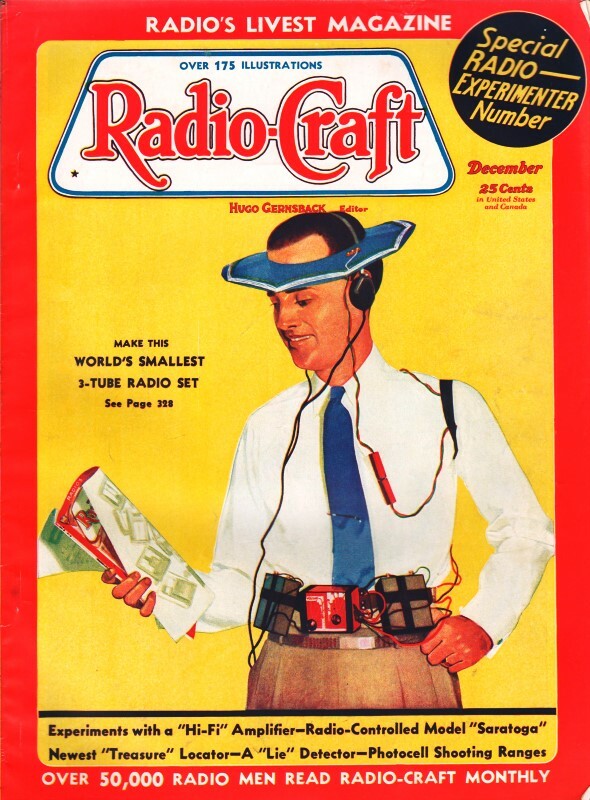 See all articles from Radio-Craft. Even though I am appreciative of and nostalgic for the memories of 'old' ways and means, I definitely am glad to have modern technology. Take a look at the bulk of that simple function selector switch which was part of the electromechanical escapement for the Sarasota model ship. The 160-meter CW ham radio band was chosen for communications. Even a simple 1/4-wave antenna is 40 meters long (~131 feet), requiring the wire to be strung up in a tree and then a 'ground' conductor to be submersed in the water (see Fig. 1f). 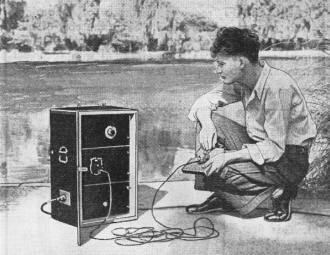 In 1936, there were no unlicensed radio bands like today that allowed operators to transmit without a license; an amateur or commercial ticket was required. 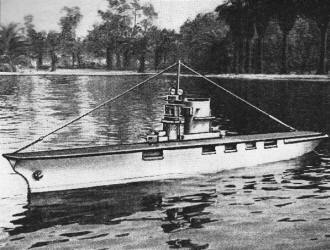 Details for making a short-wave radio-controlled model of the airplane carrier "Saratoga." Fig. A. The ship under full radio control from the shore. A long, slim gray model of the plane carrier Saratoga rests beside the landing. Suddenly, without apparent reason, it comes to life! Water churns under its stern! Its propellers grip the water, it clears the landing, stands down channel, rounds the buoy and swings into the lake! A mystery? yes, unless you know how it works, for to the average person radio control and "mystery" control are the same thing. 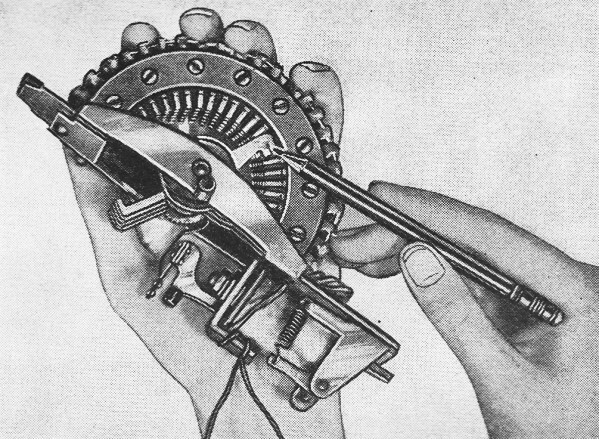 Radiodynamics, the remote control of mechanisms without using connecting wires, undeniably is a most interesting example of applied science; furthermore, it is an application well within the capabilities of the average hobbyiest. In the following article for Radio-Craft readers we have attempted to take some of the mystery out of radio control by outlining the essentials of a radio control system and then showing their application in the control of a model. Any remote-control system, as a general rule, may be reduced to 3 major components: (1) a transmitter, to radiate energy; (2) a receiver, to pick up a portion of the radiated energy and convert it into an electric current or mechanical motion of useful value; and last, (3) a selector, to allow the operator to choose the circuit or circuits he desires to control. Figure 1A shows a simple control system embodying these elements. Briefly, it works as follows: each time the key is closed a signal is sent from the transmitter and picked up by the receiver. Each impulse closes the relay in the receiver output, actuates the selector magnet, and through the pawl and ratchet moves the wiper W from one contact to the next. Thus, by sending the correct number of impulses anyone of the circuits connected to the selector contacts may be energized. Fig. B. The receiver and control mechanism on the ship. Fig. C. The selector switch-the "heart" of the control. Fig. D. The appearance of the transmitter in use. Fig. 1. Circuits and details of the construction. Fig. 2. Details of the receiver control unit construction. Such a simple selector system is only satisfactory when controlling slow-acting mechanisms. For example, in moving from contact 1 to contact 4 the circuits connected to 2 and 3 are momentarily energized by the wiper - an intolerable situation if circuits 2 and 3 are fast-acting. This difficulty was eliminated in the Saratoga's selector circuit by a slow-release relay. Figure 1B is a diagram of the selector circuit used on the Saratoga; Fig. 1C is a drawing of a slow-release relay similar to the one used in the selector circuit. Neither slow-release relay contacts nor sensitive-relay contacts should break heavy currents; hence, the intermediate relay between these contacts and the circuits they control. An incoming impulse, after passing the sensitive- and intermediate-relay contacts, energizes both the selector magnet and the slow-release relay, which, through its intermediate relay, opens the common lead to the controlled mechanism. After the impulse passes, the wiper is resting on the next contact, but the common lead to the controlled circuits will not be connected until the slow-release relay contacts close, a quarter of a second or so later. Thus by sending impulses with a period of less than a quarter-second between them the wiper may be moved to any desired contact without energizing the contacts passed over, but a moment's wait on the circuit wanted and the relay will connect it. The copper collar on the core of the relay gives it its slow-release properties. Disturbances are set up in the magnetic field of the relay when its coil current is cut off at the end of an impulse. These disturbances induce currents in the copper collar that maintain the field of the magnet for a short time and hold the armature against the pull of the spring. The armature in turn holds the contacts open. If the selector is made from units purchased on the market there is little to say about its wiring. The condensers connected around the contacts used in breaking heavy currents, .are to absorb spluttering and arcing that burn the contacts and "disturb" the radio receiver. It is suggested that the selector and associate relays be mounted in a grounded metal box. 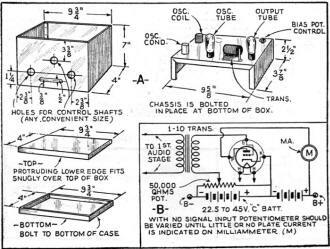 Tube bases and sockets provide a handy means of connecting and disconnecting the leads to the selector circuits and selector contacts; mount the tube sockets on the side of the box and use the tube bases for plugs leading to the battery, receiver, and controlled circuits. The person who makes his own selector must be prepared to use a considerable amount of ingenuity. Here are a few suggestions: the author's first selector was made from a large single-stroke bell, and some scrap brass; the ratchet was a gear from a toy construction set. 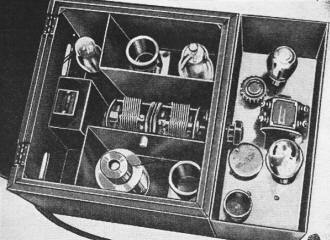 A telegraph sounder, with a few changes and additions, will also make a satisfactory selector. Old relays may be obtained from a number of sources. A satisfactory sensitive relay can be made from a good grade telegraph relay. Rewind the coils of the relay with No. 36 gauge enamel-insulated wire. Care should be taken when connecting the rewound coils to have the polarity of the coils opposite; i.e., one pole of the relay should attract the North pole of the compass and the other pole should repel it when the relay windings are tested on a 22.5-V. battery. If both windings attract the North pole of the compass, or if both poles repel it, the connection to one of the coils should be reversed. Relays from combination "'B" eliminator battery-charger units, when rewound with No. 28 gauge D.C.C. wire make satisfactory intermediate relays. Automobile cut-outs, because of their large contacts, can handle fairly heavy currents. Strip off the heavy outer winding and use the fine winding for the relay coil. Unless the experimenter takes every precaution to insure a reasonable degree of frequency stability in both transmitter and receiver his "control" - to say the least - will be very erratic. Our answer to the stability problem (the transmitter and receiver combination used to control the Saratoga) incorporates a unique feature that insures the stability of both units - crystal-controlled oscillators are used in both transmitter and receiver. The system works as follows: A crystal-controlled transmitter radiates a signal of, for example, 1,000 kc. This signal is picked up at the receiver antenna, amplified in the R.F. amplifier, and fed to the detector where it mixes with the signal produced by the local oscillator in the receiver. When 2 alternating currents are thus combined, they produce, among other frequencies, a beat note equal to the difference of the 2 frequencies. Assume the frequency of the oscillator in the receiver to be 1,001 kc. The resulting beat note will be 1,001 kc.-1,000 kc. or 1 kc. (1,000 cycles), an audible frequency that is fed through an audio amplifier, and an audio rectifier- before going to the relay. A good wavelength region for radio control experiments is the 160-meter C.W. band, because at the present time it is probably the least used of all amateur bands. (The builder must remember that an amateur license is necessary before any transmitter can be "put on the air." - Editor) Hence our suggestion that the reader have his crystals ground to some frequency in this band-and make it well toward the center of the band, too, so as to avoid "splatter" from 160-meter phone rigs and nearby police or broadcast stations. We suggest that the reader order his crystals direct from the manufacturer, telling him the approximate frequency wanted and explaining that the crystals must be ground to between 1 and 2 kc. of each other. It is also best to buy the crystals with their holders because changes in holders often make a very appreciable difference in the frequency of the crystal. Figure 1D is a circuit of the transmitter; Fig. 1E a suggested layout of parts. The variable condensers are not led to knobs on the front panel for a very good reason - if they are adjusted correctly the first time, they seldom, if ever, need be adjusted again. (Dials on the front panel are only an invitation for the operator or some one else to "tinker".) The jacks are for the transmitter key plug and to facilitate adjustment. 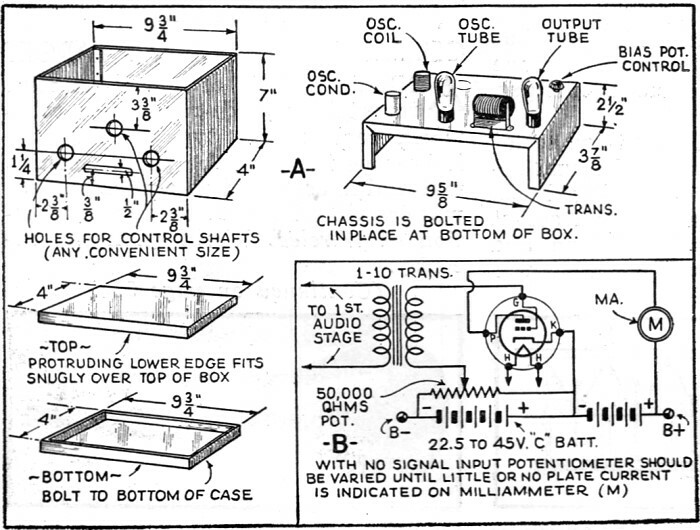 The first step after completing the transmitter before power is turned on is to put a plug in jack A, cutting off the plate supply of the 79 tube. Next plug a milliammeter in jack B and allow the filaments to warm. Next rotate condenser C1 to a point where a pronounced dip or drop in plate current is noticed. At this point the oscillator-stage is functioning. This point can also be found by holding a single-turn coil connected in series with a flashlight bulb in the field of coil L1 and rotating the condenser. At the point where the circuit breaks into oscillation, the lamp will light. Next the amplifier must be neutralized. Hold the pick-up coil described above in the field of coil L2 and rotate condenser C2 until the light glows. Then vary condenser C3 until the glow disappears. Vary condenser C2 throughout its entire range to find if there is another point where the glow reappears. If there is, continue adjusting C2, C3 until C2 can be varied through its complete range without causing the lamp to glow. Next remove the plug from jack A and adjust the amplifier for greatest output either by watching the reading of a milliammeter plugged in the jack and tuning the condenser for the least plate current, or by holding the pick-up coil in the field of L2 and tuning for greatest brilliancy. Now we come to the antenna and coupling coil. The antenna is made of 45 ft. of No. 14 gauge enameled capper wire. Connect a g lass, receiving-type insulator to one end of the antenna. A light rope connected to this insulator provides a handy way to string up the antenna as shown in Fig. 2F. Connect 6 or 8 ft. of No. 28 gauge D.C.C. wire in series with a flashlight bulb between the antenna and ground posts. With the transmitter connected, wind turns of wire on the end of the coil L2 form until the flashlight bulb in series with the antenna begins to glow. Continue adding wire until the lamp in the antenna circuit reaches a maximum brilliance and starts to dull. During the process of adding this coil occasional changes may have to be made in the setting of C2 to keep the current in the amplifier plate-circuit low. Do not tamper with the adjustment of C3. Once the neutralization process is finished, it should be left alone. After the ends of coil L3 are soldered in place, C2 should be adjusted until minimum plate current is shown in a milliammeter placed in jack A. The oscillator plate current as shown by a milliammeter in jack B should be brought near to a minimum by means of C1. The transmitter is now complete and adjusted except for slight changes that may be desirable in the adjustment of C1 when the receiver is finished, to give a slightly more pleasing note in the receiver output. In part II will be described the receiving equipment and adjustments. One Triplett milliammeter, 0-50 ma. * Names of manufacturers will be sent upon receipt of a stamped and self-addressed envelope.